For years, he toiled in the world's oceans with minimal publicity and little public recognition. For decades, he continued to rake up an impressive list of successful swims that pioneered courses across many channels. Stroke after stroke, mile after mile, hour after hour, he swam through cold, warm, rough, calm, salty and sharky waters, escorted by his wife, enabled by his co-workers, and constantly supported by his family. 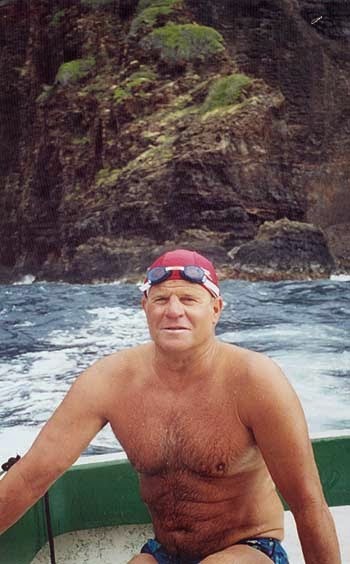 The reputation and talents of David Yudovin were well-known among the small niche of marathon swimmers and channel swimmers in the 20th century, but his exploits are only now becoming widely acknowledged by those who follow in his wake. Yudovin was not only inducted in the International Swimming Hall of Fame this year, but he also became the namesake of an award: the Yudovin Award. The Yudovin Award is awarded by the Marathon Swimmers Federation as part of its MSF Global Marathon Swimming Awards that also include the Solo Swim of the Year (to honor the single most outstanding marathon swim of the year), the Barra Award (to honor the most impressive year of marathon swimming), and the Service to Marathon Swimming Award (to honor individuals who have selflessly given their time and energy to advance, enrich, and support the sport of marathon swimming). The Yudovin Award honors the single most adventurous swim of the year as voted upon by the MSF membership. The MSF explains its newest award, "The Yudovin Award is meant to recognize the spirit of adventure, the most interesting swim, or the most unusual swim." In the twilight of his 4-decade career, Yudovin continues to add luster to the sport. To nominate individuals for this award, post here.